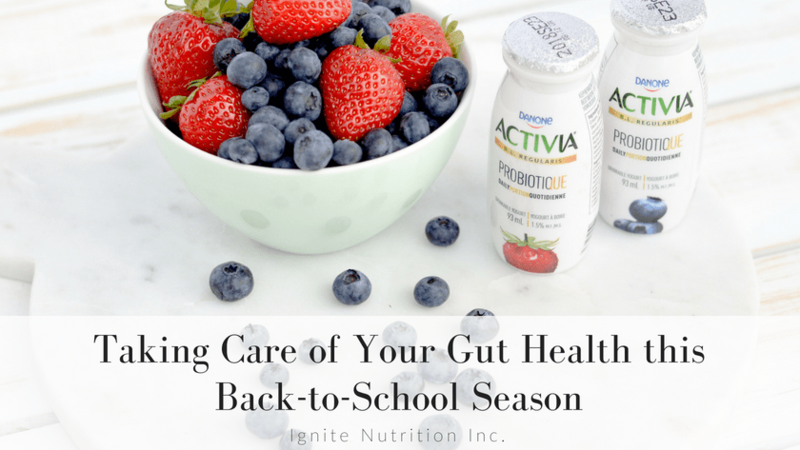 Taking Care of Your Gut Health this Back-to-School Season | Ignite Nutrition Inc. This sponsored post is brought to you by Danone. They’ve kindly compensated monetarily me to develop this post on how to take care of your gut health this Fall, something you all know I’m super passionate about! Back to school is great for getting the family back into a routine – but often comes with added stress and a busy back to school schedule for moms… even the most experienced ones! Maintain healthy and balanced nutrition can be hard while trying to make sure your family is ready for this back to school season. I have my top tips for you to make nutritious, easy choices during this crazy period, so you can keep taking care of your overall health! With a busy schedule, we often have to make compromises. With less and less time – having easy items on hand can be super helpful to keep your sanity. A lot of times, moms can easily prioritize their family’s nutrition over themselves. I like to tell my patients – you have to put your oxygen mask on first– and having some easy items on hand can help you do that. I find in my day-to-day busy schedule, having grab-and-go snacks on hand helps make the healthiest choice, the easiest choice. Often times, if we have items that require a lot of prep, and our schedule gets thrown off – it’s really easy to end up at the drive-through and be left with a fridge full of ‘ingredients’. 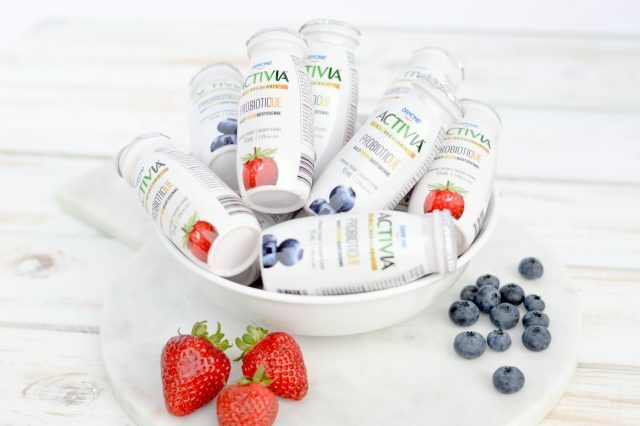 One of MY favorite grab-and-go nutrition snacks is the new Activia Drink. It’s a delicious and simple way to help me take care of what’s inside every day. And what I love the most about it is the fact that it contains 6g of sugar. With 25% less sugar, it is the drinkable probiotic yogurts with the least sugar on the market. Talk about a healthy choice that is also good for your gut flora! Having a daily routine focused on a healthy, balanced diet can not only help us physically, but also mentally. 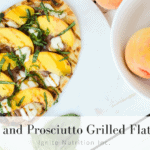 When we fuel our body well, we can get the nutrition we need to accomplish our activities, and the inner strength to overcome daily stress and challenges. My top tip for keeping nutrition less stressful is to plan ahead. Many people think meal planning is ONE skill, when in fact, it’s many! I’m going to teach you 2 skills to keep your stress levels down during the back to school season. Simply pair a category up with the day of the week. When we narrow down our choices, it’s much easier to make a plan. My second tip is ALL about snacks. How often do say to yourself – oh my goodness – I’m SO hungry – but I have NO idea what to have. Often times, I find that we are ignoring our hunger, which often leads to low energy, and poor nutrition choices later in the day. I like to have a variety of snacks I can pick from – things I know are nutritious and feel good about eating. My current snack-obsession is the new Activia Drink. Not only it contains Activia’s exclusive B.L. 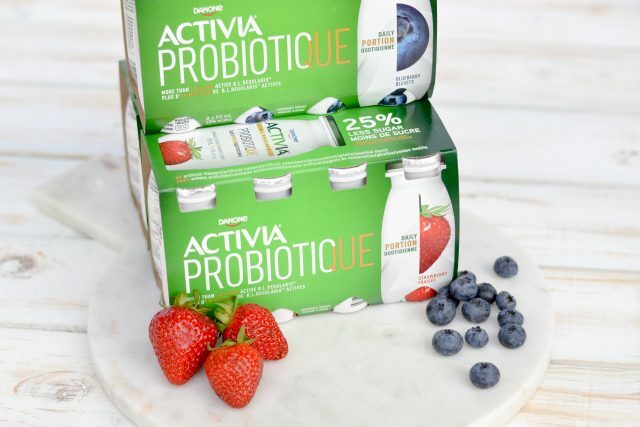 Regularis probiotic culture, this new drink format also has the same Activia’s renowned smooth and creamy taste and texture. Another reason to love it? It is made with real ingredients – no artificial flavours or colours, no preservatives, and real fruit – making it a great choice for a snack. 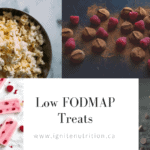 I often like to pair snacks with a piece of fruit – that bit of fibre helps to fill you up, keep your gut microbiota well fed, and most importantly – is easy to keep on hand. I recommend keeping snacks somewhere accessible – at eye level in the pantry, and at a reachable drawer or shelf in the fridge – so the healthiest choices can be right in front of you. Having delicious and healthy food always near you will encourage you to avoid settling for something less nutritious. These tips help to take the ‘think’ out of your food choices and are an easy way to take care of yourself. I often like to challenge people to ‘eat something living every day’. Activia Drink is a great way to do that. With over 1 billion CFU of good bacteria B.L. Regularis probiotics in each serving of Activia, you can be sure you’re introducing good bacteria that contributes to healthy gut flora. 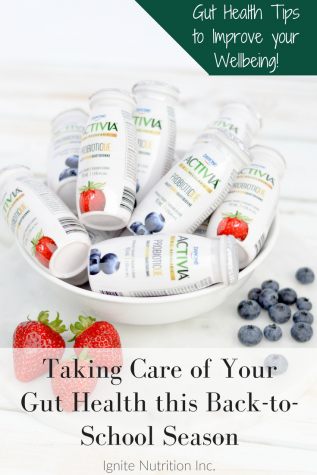 This is especially important, because according to some studies, probiotics are beneficial for digestive health, and as a digestive health dietitian, we know digestive health is key to a person’s overall sense of wellbeing. While research into gut health is quite new, and we’re still learning what it is that makes a healthy gut, we do know that eating a variety of foods, introducing probiotic containing foods, and consuming enough fibre is likely to help maintain a healthy gut microbiota1. Love the tip on keeping healthy snacks at eye level in pantry. And the Activia is a great way to have yogurt AND be able to have an easy snack. Fab info as always ? ?